October is National Domestic Violence Awareness Month and Becca at The Damsel of Distressed has once again organized The Hop to Stop to bring attention to the cause. Domestic Violence can be closer than you think, with 1 of 3 women experiencing domestic violence over the course of their lifetimes, chances are you know someone who has or will be a victim. Click here to visit Becca's blog and for details about The Hop to Stop. 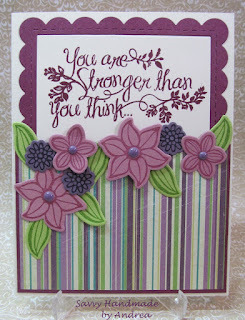 When deciding on a design for my card, I knew I wanted to use this sentiment by Stampin' Up! from the Heartfelt Sympathy stamp set. To me, it makes a great encouragement card for more than just sympathy. When you pair the sentiment with some pretty purple flowers... hopefully it's uplifting for someone who has experienced domestic violence. Paper: Very Vanilla, Rich Razzleberry, Sweet Sugarplum and Perfect Plum cardstock, green cardstock by Bazzill Basics along with striped paper by My Mind's Eye. Stamps: Heartfelt Sympathy and Falling Flowers. Inks: Rich Razzleberry, Sweet Sugarplum, Perfect Plum and Wild Wasabi. Other Stuff: Big Shot, May Flowers framelit dies, Scalloped Frame by Taylored Expressions, Perfect Plum enamel dots and dimensionals. Lovely design! Awesome sentiment. (And I just love the names of the ink colors you used. lol). I can see why you like that sentiment!! It is gorgeous!! I love the way you've made those flowers into a statement by fussy cutting them. Thank you so much for raising your voice at the Hop to Stop. That is the perfect sentiment for an encouragement card! Your card is absolutely beautiful! Such a beautiful card. 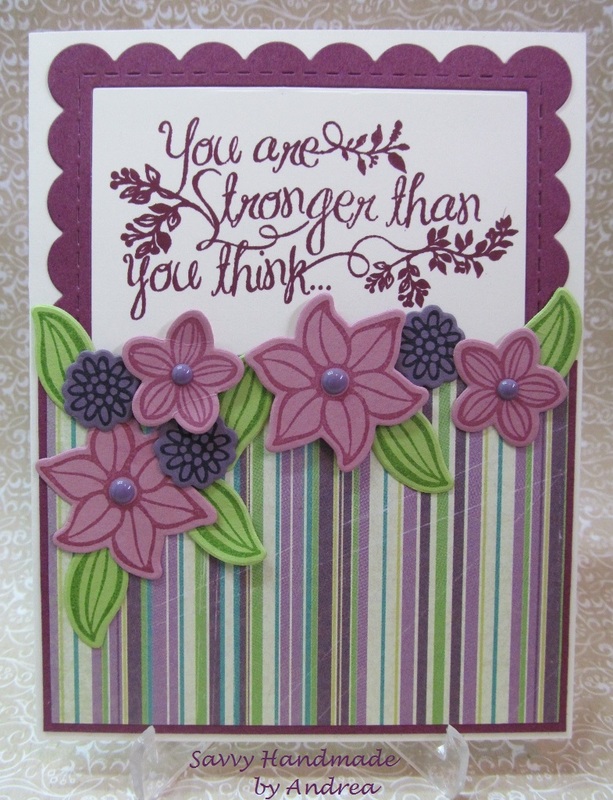 Love those layered flowers, they're the perfect accent to that lovely sentiment. I love the beautiful flowers and the sentiment is so appropriate. Adding a pop of green also really makes the purples pop! This is beautiful!! Love it! The flowers are so pretty with that striped paper..
Beautiful! Love the waterfall of flowers and the sentiment is perfect! This card is so colorful and pretty -- great cause you made it for. Love the striped panel and the perfectly coordinating flowers. The sentiment is just the right encouragement! I super LOVE that perfect sentiment. Very beautiful card! Thank you for playing along at Brown Sugar this week. wow! such a pretty card :) love the flowers and the sentiment is so apt! Beautiful card for such a great cause! I love the purple flowers and the pretty paper! A delightful card with a powerful message of hope.